Short-hand for “Qualified Green Building and Sustainable Design Project Bonds”, Green Bonds are tax-exempt debt instruments for which all proceeds are directed towards environmental projects, such as wind, solar, hydroelectric and geothermal energy. Why should you care? Green bonds are not new – in fact, the first issuance dates back to 2007. But over the past year we have seen a marked escalation in green bond issuance. According to Bloomberg, $18 billion green bonds were issued in the first half of 2014. 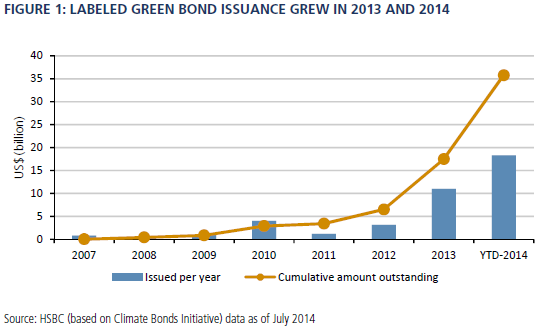 For context, $18 billion is just about equivalent to the total volume of green bond issuance from 2007 – 2013. At this velocity, green bonds will surpass $40 billion by the end of 2014. Industry experts anticipate $100 billion by 2015. The increase in green bond issuance is just one more example of a changing landscape, a landscape in which individuals and corporations are beginning to care about things in addition to money. But what’s more important than money?! Green bonds, though a minor component of a wide realm of possible investments, are exemplary of a venture that makes both financial and ethical sense. Financial institutions who issue and underwrite green bonds can appeal to a certain niche (a growing niche) of clients who care about the environment. Last year, Bank of America issued the first ever corporate bank green bond ($500 million) and enjoyed a whole new plethora of investors. Companies of the likes of Toyota, Unibail-Rodamco, and NRG Yield have been using green bond proceeds to finance loans to purchasers of hybrid and other energy-efficient vehicles. 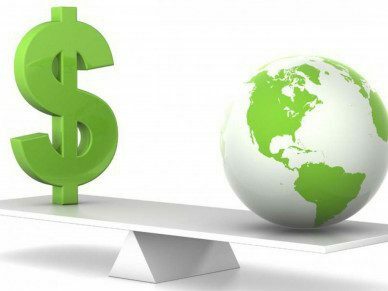 And most importantly, green bonds allow companies and investors world-wide to act in ways that benefit the environment. “We, as investors and fiduciaries, understand that we have a responsibility to address threats to the future performance of our investments from climate change as well as a responsibility to secure our clients’ savings through sustainable and responsible investments. We believe green bonds can be part of our strategy to accomplish both of these aims. Here’s why this is interesting. Fiduciary duty exists as a tremendous obstacle to widespread implementation of ESG investing. But the above seems to indicate that fiduciary duty (at least according to these signatories) actually encompasses such consideration. Fiduciary duty has governed the investment process since the beginning of time, and is largely understood as achieving maximum return per unit of risk. But if beneficiaries place at least an equal weight on “doing good” as they do “making money”, this will undoubtedly be reflected in the interpretation of fiduciary duty. But at the very least, the green bond movement marks a significant leap in the right direction. Do the green bonds sport a higher yield than traditional bonds? This year – probably because tax rates have risen, has been a great year for returns to munis! Go green! What are the default rates of these green bonds?